Hair rebonding or ironing to straighten your hair can cause great damage to your hair because of the chemicals in the hair straightening perm and the heat from the use of the hair iron, which will destroy the cohesiveness of the hair molecules and result in the moisture loss, breakable and prone to static. Apply a small amount of the gel on your palms, massage all over your hair to the ends especially before ironing or blow-drying the hair. 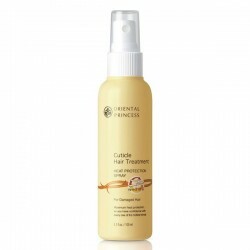 Use on wet or dry hair.